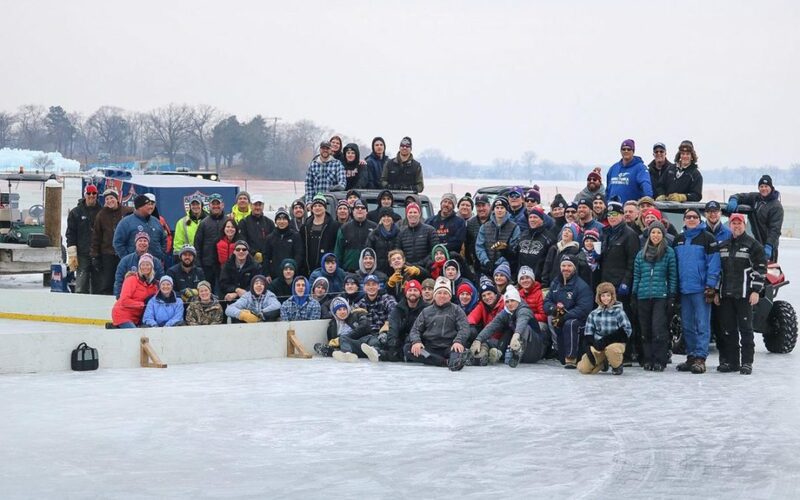 EXCELSIOR — It was a “well-oiled machine” on Lake Minnetonka Saturday morning as crews built rinks for the North American Pond Hockey Championship. The annual pond hockey tournament put on by the DWB Memorial Foundation will take place on Lake Minnetonka behind Maynards Restaurant, 685 Excelsior Blvd., in Excelsior, Jan. 17-20. And the ice this year is perfect. Jenny Mattiacci, who is on the DWB Memorial Foundation board, told Lakeshore Weekly News it is “the best ice” they’ve had in years. The North American Pond Hockey Championship has been going on for more than a decade, but this will be the seventh year it is run by the DWB Memorial Foundation, a foundation set up to honor Shorewood resident David Wynn Bigham, who died in 2012. The tournament raises funds for local charities. This year’s beneficiary is the Hendrickson Foundation, with Danny Hendrickson telling Lakeshore Weekly News the hockey tournament has given $90,000 to the foundation since 2016. The Hendrickson Foundation supports programs that give people with disabilities the opportunity to play hockey, including Minnesota Sled Hockey, Minnesota Special Hockey, USA/Minnesota Warriors and Minnesota Blind Hockey. More information can be found at www.hendricksonfoundation.com. The pond hockey tournament begins at noon Friday, with the last game starting around 4 p.m., Draayer said. Games will go all day Saturday, with championship play scheduled for Sunday. A bean bag tournament on Saturday, with championship play on Sunday. Benefit concerts in the Club Cambria tent. Tim Sigler will perform Thursday, The Johnny Holm Band on Friday and Chris Hawkey on Saturday. Funds from the Saturday night concert will be donated to the local chapter of the ALS Association. The Flurry Scurry 5K walk/run on Sunday morning, which will benefit DinoMights inner city hockey and the Twin Cities Track Club. For more information on the tournament and to buy tickets for the concerts, visit pondhockeylakeminnetonka.com.